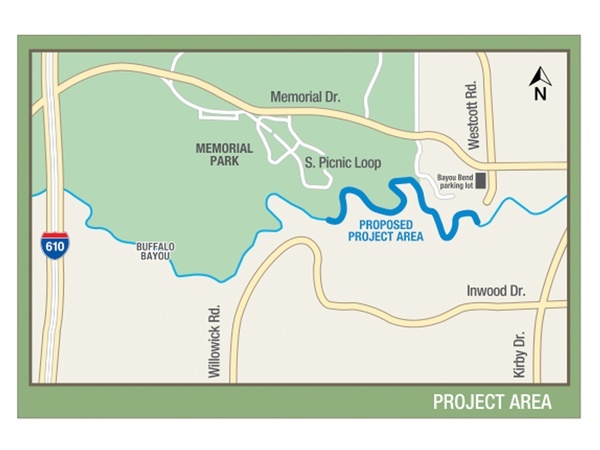 A portion of the work being done on Buffalo Bayou, known as the Memorial Park Demonstration Project, is drawing opposition for being too big a change to the natural state of the bayou. Borne of a 2010 workshop hosted by the Bayou Preservation Association, the project calls for reshaping the banks of the bayou that wind past the [River Oaks Country Club], the Hogg Bird Sanctuary, a residential neighborhood and the southernmost border of the 1,503-acre park. According to the Harris County Flood Control District, which will oversee the project, the plan would “create a self-sustaining bayou that would slow the erosion process” and potentially serve as a model for future projects – if it works. The project would be the first along the bayou to employ “natural channel design techniques,” as opposed to traditional concrete lining, something Mayor Annise Parker and County Judge Ed Emmett describe as a sign of progress. It has been dubbed a “demonstration” project because officials say it would showcase the benefits of the methodology. Groups such as the Sierra Club and the Houston Audubon Society, however, say the plan would destroy all wildlife habitat along that stretch of the bayou, and that the science behind it has not been proven to reduce erosion. And did you know that Houston has rocks? And cliffs? Yes, you can see very old sandstone rocks along the banks of Buffalo Bayou when the water is flowing normally. That is, when they’re not releasing so much water from Addicks and Barker dams. And for a vertiginous thrill, stand at the edge of the high cliff in the Hogg Bird Sanctuary. It may look like an active erosion problem to some cityslicker eyes, but to others it’s a beautiful work of nature that hasn’t changed much in 45 years.